Four-day festival will see performers from around the globe. 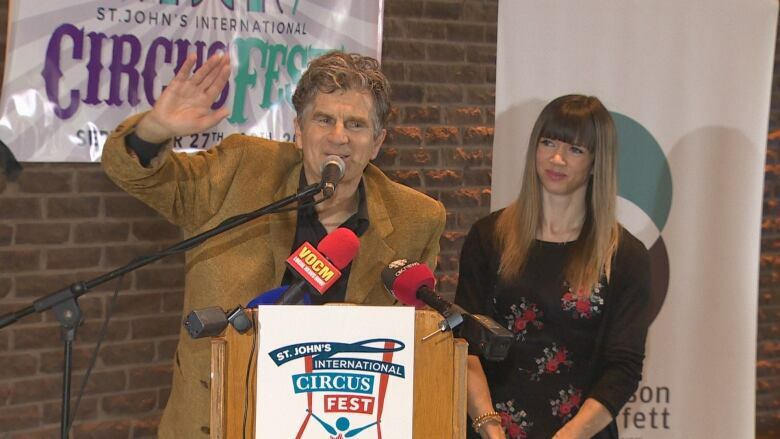 St. John's is getting its first International Circus Fest in late September, with host Wonderbolt Productions making the announcement on Wednesday with some flair. Aerial and hoop artists gave attendees a sneak peek of what's to come in what Beni Malone, artistic director of Wonderbolt, called a "circus press conference." The four-day festival — running from Sept. 27 through Sept. 30 — will see performers from across the globe flying into St. John's. The lineup will feature acts like the 7 Fingers collective from Montreal, Irish aerial company Fidget Feet, Swiss hula hoop artist Jessica Gasser and several artists with Cirque du Soleil. The National Circus School will also be doing a joint show with the Newfoundland Symphony Orchestra. Community members can join in on the circus craze with juggling and acrobatics workshops on a designated Family Fun day as well. As for circus professionals, there will be a number of panels and workshops for them to network and learn. Malone has been a part of the local circus scene for more than 30 years. "We've been wanting to do this for years," said Malone, adding the time was finally right. With St. John's getting its own juggling club and unicyclists riding down the streets, Malone said the industry has clearly grown. "It's exploding, and I think it's really the right time for us ... because we've earned it." Susan Jarvis, a St. John's native and circus artist, said it felt as though she had been waiting for an event like Circus Fest to happen for her whole life. "Now, I don't have to run away," she joked. "I'm right here in my own hometown. I don't have to go anywhere. I can just be a circus performer in my own city, and it's wonderful." Malone called the series of events that led to the festival's start serendipitous. He was at the same event as Marc David, head of the Longueuil Orchestra, when he discovered that David was also the director of the Newfoundland Symphony Orchestra. When he approached David, Malone was delighted to learn the NSO had an opening at the same time he wanted to put on the festival. "It was a sign," Malone added. Support from businesses in the area has also been incredible, said Malone. "They've been very generous, very supportive, very open-minded," he said. "Everything has come together now."